The Oakville Chamber Orchestra presented an evening of extraordinary music making for its final concert of the 2015/2016. 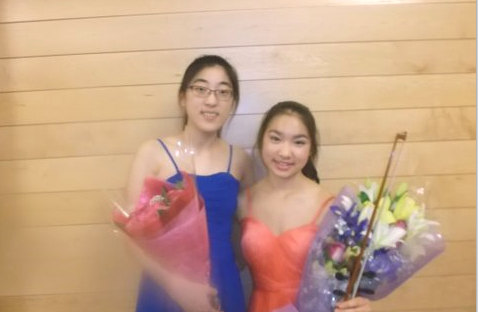 The Concerto Competition Grand Prize winners presented two wonderful concertos – Catherine Ma performing Beethoven’s Piano Concerto #4 and Tiffany Yeung, playing Mendelssohn’s Violin Concerto in E Minor. The evening began with a pleasant rendition of Mozart’s Overture to the Marriage of Figaro played by the Oakville Chamber Orchestra. This extremely well-known piece of music begins a rather subversive opera, on the theme of the untrustworthiness of the nobility, and the resourcefulness of servants. The first young competition winner was Catherine Ma, a 15-year-old pianist, who won her first Canadian Music Competition at the ripe old age of 8. She recently came 1st in the International American Protégé Piano Competition. The Beethoven Ma chose to play, is the last of his four Piano Concerti. It begins unusually with the solo piano playing the main theme, which is then handed over to the orchestra, while the piano is silent, creating an air of mystery. This must have seemed very different, and perhaps a little odd, when it was first performed. Ma is an exceptionally mature performer for her age and managed the nuance from sunny to introspective in the expansive first movement quite brilliantly. The acoustics in St John’s United Church were excellent and the Bluthner piano, on loan from Remenyi, left the audience awash in bright, gorgeous sound. The short andante consisted of a dialogue back and forth between the piano and the orchestra, and the final rondo was fast with a more playful back and forth, and an occasional dash of drama. Ma seemed to really enjoy playing it and the orchestra responded with gusto. She received a well-deserved standing ovation. After the intermission, 13-year-old, Tiffany Yeung, took the stage. Her small, fine hands, displayed a definite strength. She exhibited no trace of nerves, and thoroughly commanded the stage, as she played the opening, Allegro Molto Appassionato of the Mendelssohn. She exhibited a clear understanding of both the passion and the longing in the piece, sometimes drawing out certain phrases. In one extremely difficult passage, the audience literally listened with bated breath, and sighed when she grinned with pleasure.